KALAMAZOO, MI -- Braving the heights to install a nesting box outside the 13th floor of the Fifth Third Bank building in downtown Kalamazoo seems to have done the trick. 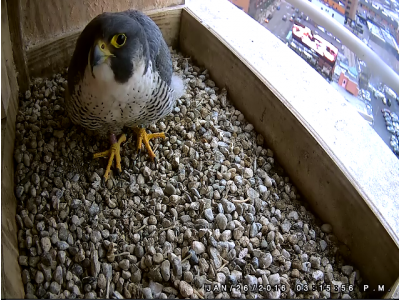 For the third year in a row, a pair of peregrine falcons has signaled its intentions to use the box to raise a family. Bird watchers can observe those actions from a video cam installed in the box. in the box, which is a sign of getting the box ready," Walter said. "Mating should happen soon," she said. Follow the link to the Kalamazoo Gazette for photos from last year's banding.